Last week E found me giggling manically at the laptop. 'It's research,' I explained. I showed him and he joined in the laughter. Last year when searching for birthday cards for E I had seen one with a viking cat on it. I walked away, returned and the card was sold. Never to be found again. 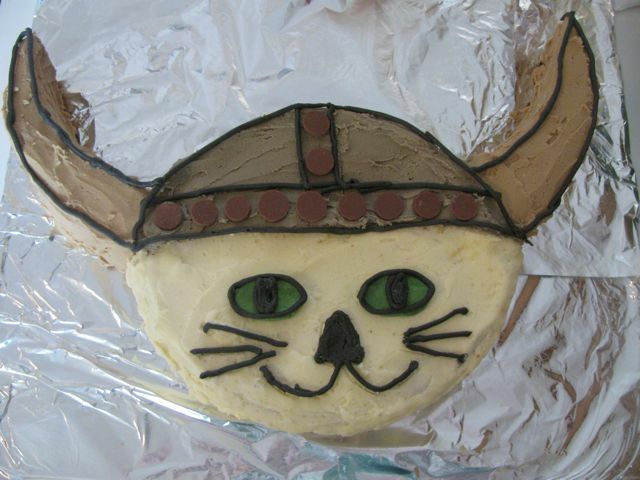 I decided that I would make a viking cat cake on his next birthday. Well the next birthday was last week and I was actually a little overwhelmed at how I would bring my brilliant idea to life. 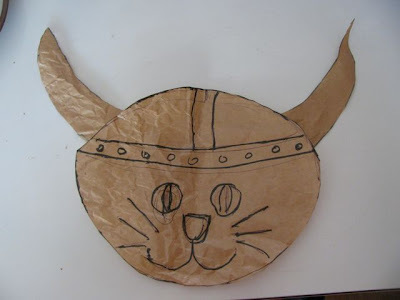 Hence, E found me surfing the net in search of viking cats. Strangely enough, there weren't other viking cat cakes. 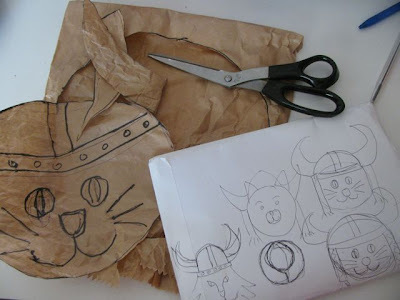 But I did find some hilarious photos of cats wearing viking helmets and a club called the Viking Cat Club (which is for owners of Norwegian forest cats). We are now wondering about making our own tin foil helmet for Zinc but I am not sure what she would think about it. E's love of cats is well documented in this blog and goes back to when he was a wee boy and pleaded with his parents for his first cat who came from a mill. I suspect his interest in vikings started young as well because he was a fan of Asterix. My awareness of it began when we went on a Viking Splash Tour of Dublin. It was a fun way to see the city and E particularly liked being encouraged to roar at people we passed by. He now loves his neofolk music in which viking mythology would not be out of place. So the viking cat felt just right for him. I made it on the weekend when we had some family around for a birthday afternoon tea. I wanted to do a cat with both a helmet and plaits but decided to do a cake that I could cut out of a round cake. Plaits were too difficult so they had to go. I have step by step instructions below on how to make a cake like mine. I do not include a recipe for the sponge cake requested by E. instead I will share my troubleshooting. 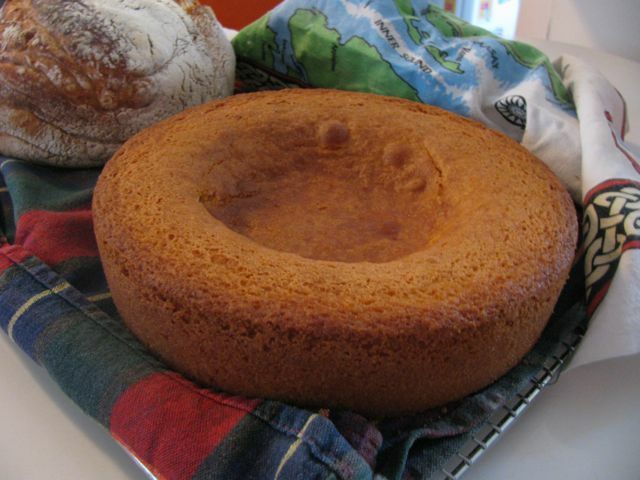 He asked for a British style sponge cake, which I call a butter cake and is similar to a pound cake. (A bit like this one). I had planned to write up the recipe but it all went a bit Pete Tong. It sunk so badly that it looked like a bomb crater. I bake a lot of cakes and rarely have this problem so I was quite perplexed. 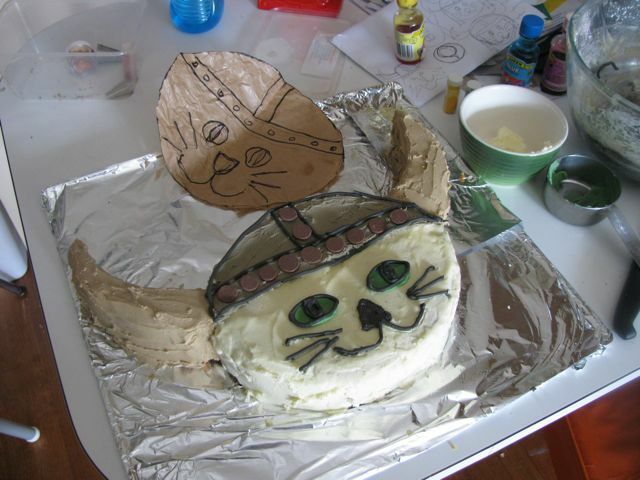 My main problem was that I needed a flat cake surface to make my viking cat cake. Filling it with cream and berries was not an option in this case. E wasn't much help when he suggested I use the nearby bowl of mixture to fill it - it was sausage roll filling! I made the cake the day before so I lay in bed thinking up solutions. I considered baking another cake and cutting out a crater shape that I could wedge in with cream. But I'd used all my eggs and it would defeat the purpose of trying not to have oodles of cake leftover. I had made some dulce de leche for E's cake on his actual birthday and I had another tin of condensed milk. My mum and I had a long discussion about what might have gone wrong with the cake. We looked on the internet for ideas. There was no obvious problem. I used the same oven, same cake tins, same style of recipe that I often use. I know I put the baking powder in and it was fresh. The recipe came from Annie Rigg's Birthday Cakes for Kids that I recently bought. It has four different size recipes for a plain sponge cake but specifies different cake tins depending on the novelty cake being made. I thought maybe I chose the wrong amount of cake batter for my tin. I also gave it a good amount of beating with the electric beaters which I don't usually do. Maybe I should stick to hand mixing cakes. I hope to do a bit more experimenting with this recipe and will post it if it will work for me because it is a good solid cake for a novelty cake decorating. However I confess that, although this is just the sort of recipe that E loves, I found it a bit dull and the buttercream was too sweet and rich for me. 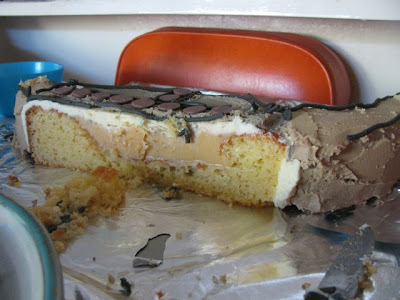 My favourite part of the cake was the caramel filling. We had a lovely afternoon tea. My mum and dad, and my sister Fran and her partner John came along. Just a small gathering for my family - due to illness and other parties - but it was very relaxing and enjoyable. Sylvia has started walking and amused us with her tottering steps and proud little smile. 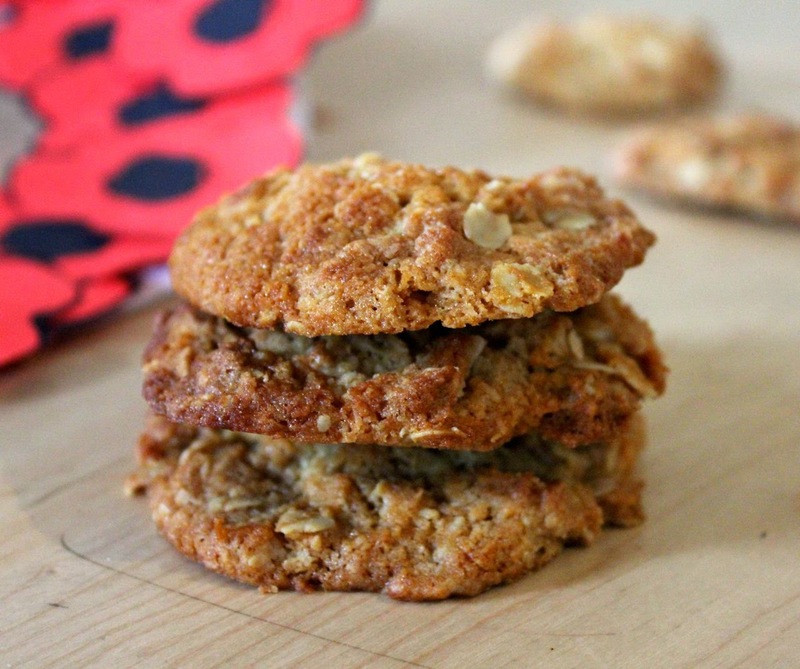 Mum brought some great Anzac biscuits because it was Anzac Day the previous day. Fran made a soft delicious banana cake with sour cream icing. I also made some sausage rolls and treacle scones (that I will post about later). Happy birthday to E and to GGG! 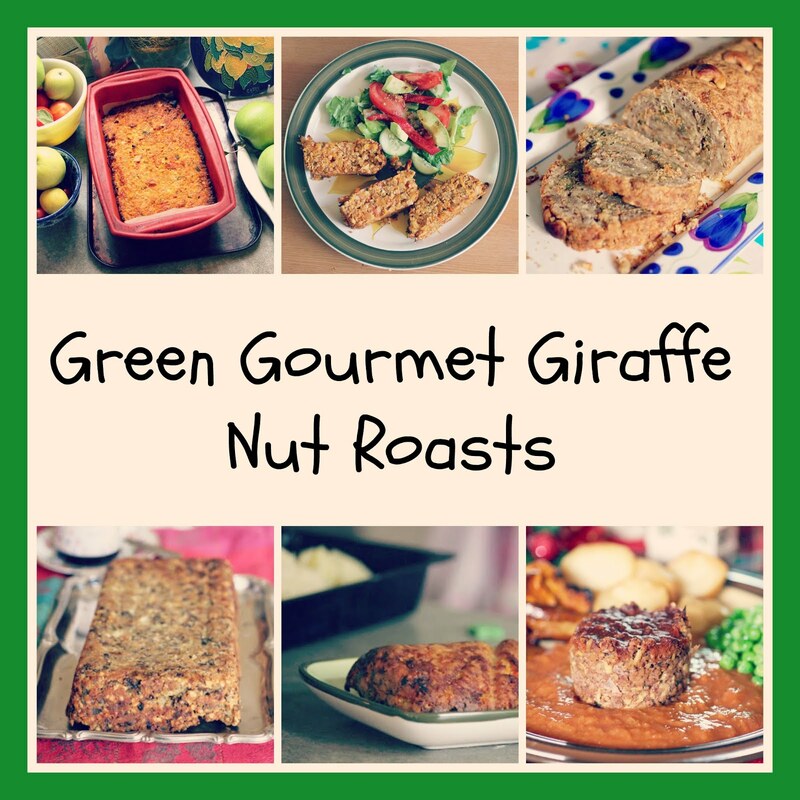 I started this blog with a birthday cake for E so he always shares his cake with the Green Gourmet Giraffe. The blog turns 3 years old today. Incredible to think I have been going so long. As the blog grows and grows, I constantly think of ways for readers to find all the recipes lingering in the dark corners of the index. 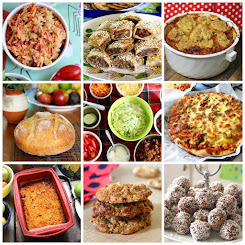 I have decided as a blogiversary present, I will trial doing a list of the posts or recipes from this time in previous years (inspired by other bloggers). I hope it will help to remind me and you of some of the blog's past gems. Any feedback on this is welcome. I started by drawing the design I needed to follow. Most important in doing this was working out how it could be cut out of a cake. I traced my cake tin on a piece of paper cut from a paper bag. I decided on a simple design of cutting two horns and having an oval face. I cut it out to check it looked ok. This template was useful for thinking about the size of the tray needed to put the cake on and also to check against when I was making the cake. I made (and rescued) my butter cake the day before. The makes the cake easier to cut into shapes the next day (and gives time to think about troubleshooting.) 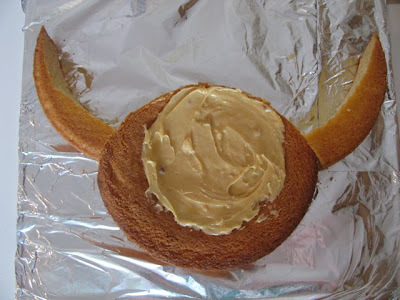 I used my template to cut the horns from the cake. 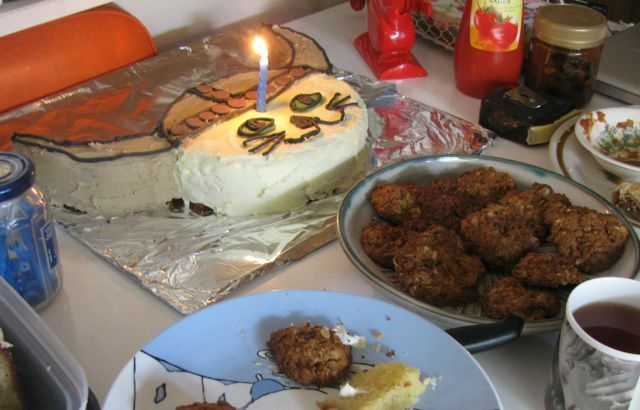 Once I had my cake cut, I covered a baking tray with foil and the arranged the cake on the tray. Next I made the buttercream. It was a far richer recipe than I usually make (and I had some leftover). I took 210g of softened butter and beat it with electric beaters til smooth. Then I gradually added 500g of icing sugar (confectioners sugar, powdered sugar). 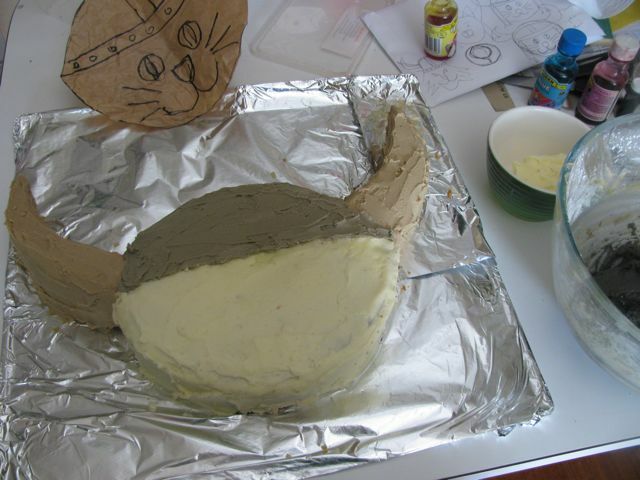 E wanted a white cat like Zinc so I spread some white icing across the lower three fifths of the oval including around the sides. Next I set aside a few spoonfuls of white icing just in case I needed some to patch the cake or cover up any problem areas. I added a combination of yellow, red and blue food colouring to the bulk of the icing to make a light brown colour. This wasn't as easy as I expected. I started with liquid colouring. But I only have pink rather than red colouring and I kept adding too much blue so it looked green. Finally I added a generous amount of the red powdered food colour (forgetting I had my beetroot food colouring - do'h!) I think the proper red helped achieve the right colour. I spread icing across the horns and used a little to stick it to the main cake/face at the bottom of the helmet. Making the helmet colour was much easier. I just added some black food colouring powder to make the brown darker. This was then spread across the top two fifths of the oval. A note on the buttercream frosting or icing. I found it was almost like working with plasticine because it was quite thick. I found at times I had to use my fingers to spread it because it really stuck to the knife. The thick icing was great when it came to making the eyes. I put a little of the white icing in a small bowl, added some yellow and blue food colourings and mixed it to make a green blob. I took two small amounts of this icing, made little balls and then flattened them into ovals. The icing actually peeled off if it was in the wrong position or the wrong shape. I made the black icing for piping by adding lots of black to the dark brown icing. Interestingly it never seemed to get black enough when I was mixing it but when it was on the cake it looked dark enough. Before piping I used a sharp knife to score where I wanted to pipe. 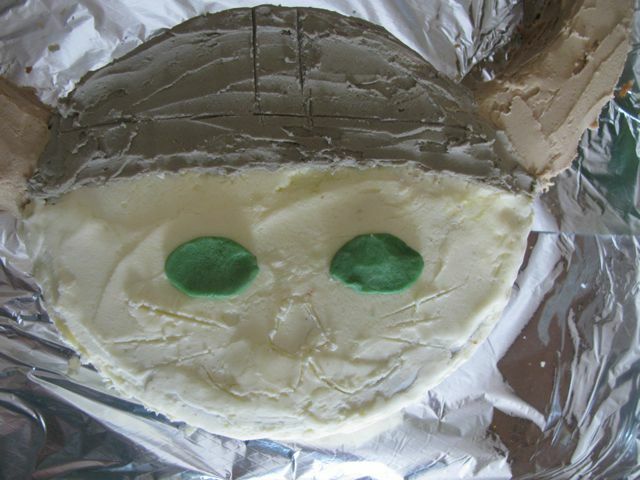 I added the chocolate buttons to the helmet trim before piping. I didn't find the piping easy. The icing was so thick that it would barely go through the writing pipe. More troubleshooting! I took the icing out of my icing gun and added just a few dribbles of water to make it more malleable. This made it easier to pipe though I still found it frustrating as it would stick to my finger if I was trying to nudge it into place. 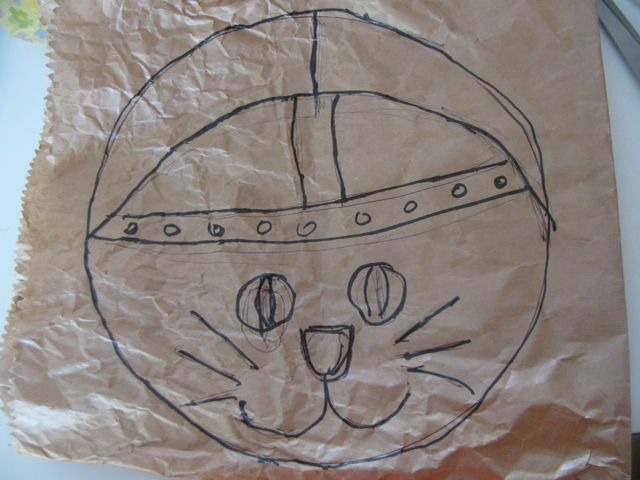 But I managed to pipe the eyes, nose, mouth, whiskers and outline of the helmet. I was pleased with my final cake. It didn't look quite like the birthday card that originally inspired it but it seemed to be a good approximation of what I had been aiming for. Grumpy's Green is a bar with a black painted verandah that does not beckon me off the street. But Cindy and Michael's recommendation made me aware it is vegetarian as well as bringing their cool name to my attention. After a phone call to check it was ok for babies, we decided to give it a go when we met our friend Yavanna and Chris for a late lunch on the weekend. Inside the front door is a dimly lit space with floral wallpapered bar and lots of cosy couches and cushions. Grumpy's has lots of small spaces - downstairs, upstairs, on the street and in the beer garden - creating lots of intimate places to sit. Chris found it easiest to choose his lunch. 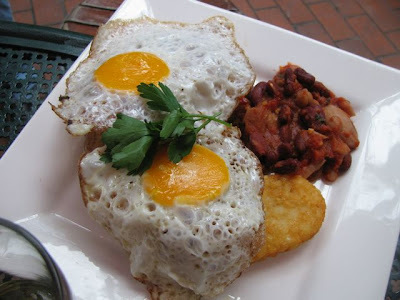 He thoroughly enjoyed his fried eggs with chilli beans and has browns. I noticed that there were a lot of sides to order with the eggs. Most of the menu was not so breakfast-oriented. 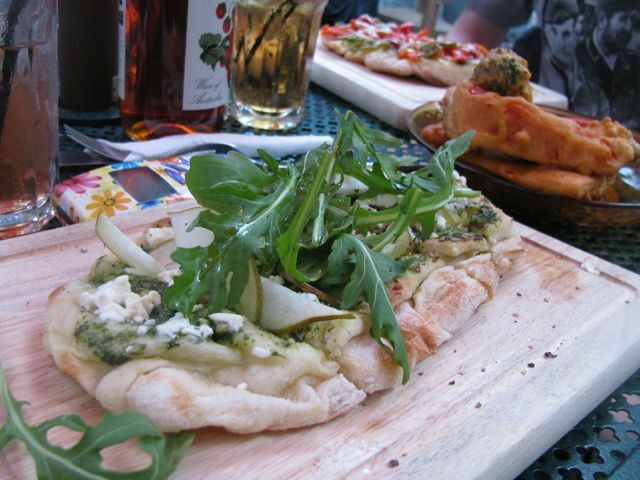 Yavanna decided to choose from both the extensive pizza menu and the small dishes. She shared these with Chris as I think they would have been too much for her alone. I tasted while we waited for our order to arrive. The stuffed button mushroom were all different - the one that I tasted was filled with dahl. Quite interesting but not really my thing. The pizza with semi-dried tomatoes, mushrooms, artichoke, capsicum and mozzarella was lovely though I ate most of the topping and then fed Sylvia some of the pizza base. Our order came slightly later (probably because we ordered separately at the bar). 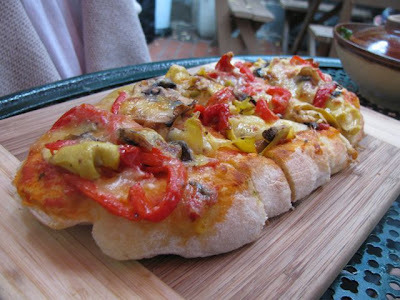 E and I had decided upon a pizza each and a shared serve of chickpea tempura vegetables in a sweet chilli soy sauce. 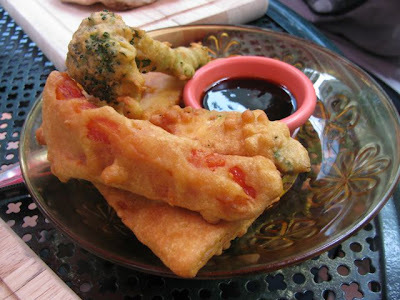 The vegetables had a lovely golden crispy chickpea batter and the dipping sauce was full of flavour and spicy heat. I particularly loved the broccoli and pumpkin. Everyone tasted them and swooned over them. 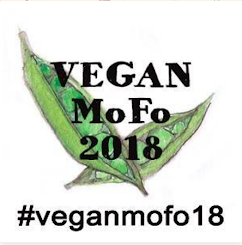 I highly recommend them to anyone looking for delicious vegan and gluten free food. Likewise I really enjoyed my pizza but was most impressed with the bases (and there are also gluten free pizza bases available but I can't vouch for their taste). 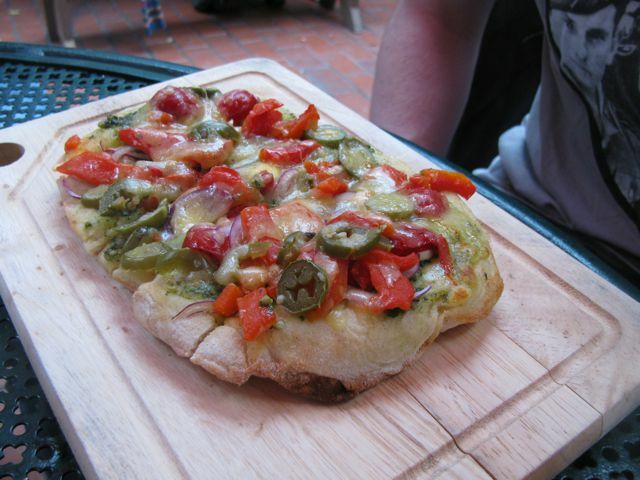 The bases were quite soft and bready and the toppings were substantial without being soggy. E loved his pizza with pesto, mushroom, capsicum and jalapeños with spicy tomato & chilli. My topping of pesto, feta, rocket and pear pizza was good but not mind-blowing, though to be fair, I was quite distracted by Sylvia. 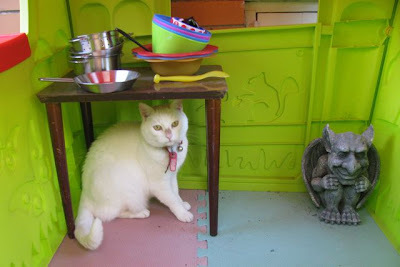 Though there were no highchairs or toys, it was a good place to take Sylvia. She could have a bit of a play on the ground and we had plenty of room for her stroller once she started eating. We were also lucky to be under a large umbrella when the rain came on. And the staff weren't at all grumpy. Everyone was really pleased with my choice of place. Yet again blogging showed me the way! While we were there, Chris and E checked out the drinks menu and commented on the interesting selection. It was only after I got home and looked up Grumpy's on the net that I read about how strongly it is committed to being environmentally friendly. The couches are second hand, the food and drinks are sourced locally, water comes from rain tanks and a few nights a week the place is lit by candle light and the gigs are acoustic. What I find interesting is that we could visit and have a good time without being aware of the environmental credentials. (As you might have noticed above, I am a bit distracted by Sylvia when eating out these days, which might be one of the reasons I didn't notice.) It just shows that many other places could be eco-friendly and the punters could enjoy themselves whether they cared about global warming or not. For me, this policy is yet another reason to return to Grumpy's Green for more. I love my blog but I struggle to keep it up to date. Not only do I have great recipes and places I want to write about (as well as other blogs I want to read), but I also have lists that need attention. One of these is my cookbook list that I wrote up at the start of 2008. I have been having lots of fun buying new cookbooks lately so I thought I should list some recent purchases/gifts to prompt me to update the list. Stephanie Alexander (2004) The Cook's Companion: the complete book of ingredients and recipes for the Australian kitchen, Penguin Books Australia, pp 1-1126. 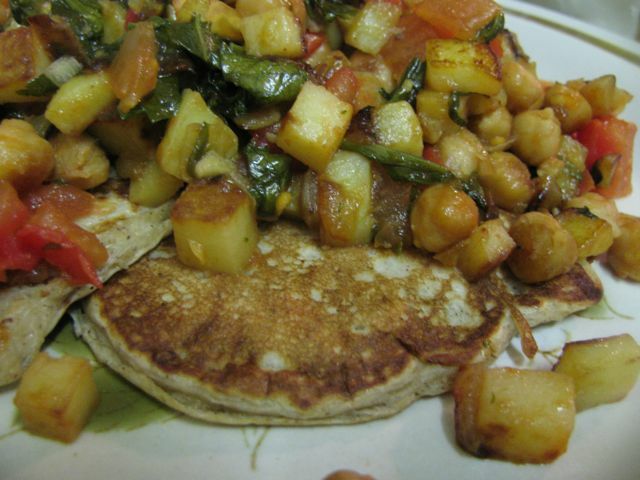 Isa Chandra Moskowitz (2009) Vegan Brunch: Homestyle Recipes Worth Waking Up For--From Asparagus Omelets to Pumpkin Pancakes, Da Capo Lifelong Books, USA, pp 1-256. Jean & Sue Easthope (1986) Classic Vegetarian Cooking, Golden Press, Australia, pp 1-184. Maria Elia (2009) The Modern Vegetarian: Food Adventures for the Contemporary Palate, Kyle Cathie Ltd, UK, pp 1-176. Rose Eliot (2006) Vegetarian Supercook, Hamlyn, UK, pp 1-192. Jim Lahey with Rick Flaste (2009) My Bread: The Revolutionary No-Work, No-Knead Method, W W Norton & Co, USA, pp 1-224. Sara Lewis (2001) Veggie Food for Kids, Hamlyn, UK, pp 1-144. David McGuiness & Paul Allam (2010) Bourke Street Bakery: the Ultimate Baking Companion, Murdoch Books, Australia, pp 1-368. Mrs N Pescott, compiled by, (1977) Early Settlers’ Household Lore, Ballarat Historical Park Association, Australia, pp 1-180. Judy Paterson (2006, reprint from 1993) Scottish Home Baking, Judy Paterson and Lindsay Publications, Scotland, pp 1-83. Annie Rigg (2009) Birthday Cakes for Kids, Ryland Peters and Small, UK, pp 1-128. Nigel Slater (2009) Tender: v. 1: A Cook and His Vegetable Patch, Fourth Estate Ltd, UK, pp1-592. Of course if I had lots of time I would make my cookbook list far more useful. I would have links to information about the book on the web, links to dishes I have blogged about, and notes of dishes I want to try. The reality however is that I struggle to keep it up to date. So I will at least try to slot these books into the list, even though I know I have bought others since I have started the list. It is a mystery to me as to why I have bought so many books lately (in recent months not weeks, mind you) when I have so little time to cook and my bookshelves are bursting at the seams, despite me clearing out an extra shelf for cookbooks recently. I confess that I haven’t even cooked from some books. Others have been inspiring. Though I haven’t cooked an actually recipe from Stephanie Alexander’s book, I have used it quite a bit. It is a great reference book with any ingredient easily searchable, good basic recipes and lists of what goes with what, all in local parlance. 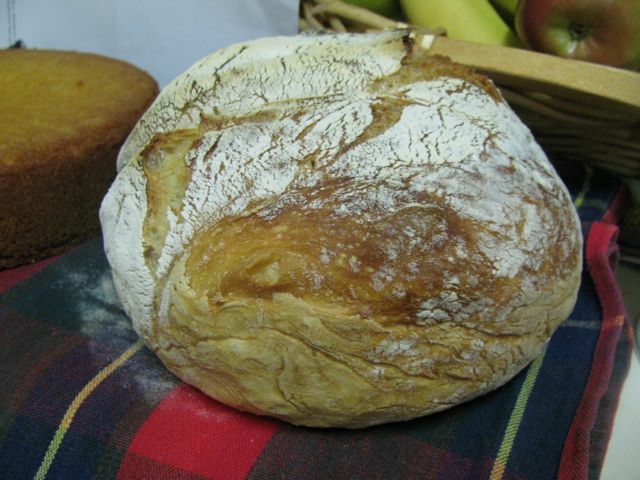 The Judy Paterson book is the best Scottish baking book I have found and I will share a few recipes from there soon. The kids birthday cake book is fantastic although the sponge I made from there today had a dip in the middle that I need to deal with tomorrow. Meanwhile, Jim Lahey’s book inspired me to make more no-knead bread today. You can see that I have been busy baking today. More on that later when I have more energy. We have had a pleasant lazy ANZAC Day, this Sunday but have felt a step or two behind all day. In the wee hours of the morning while others were remembering those who died in the wars at dawn services around the country, we were trying to get Sylvia back to sleep. I blame our tardiness on the Greek neighbours who had a noisy plate smashing party last night that made it hard to settle Sylvia. We must have been tired tonight because we spent a few hours worrying about Zinc being out in the rain, before she emerged with a big yawn from a lovely sleep in a hidey hole inside the house. Enough about my day and more about my food. I made such a wonderful simple dinner tonight that I thought I would share it, though it is not a recipe as such. 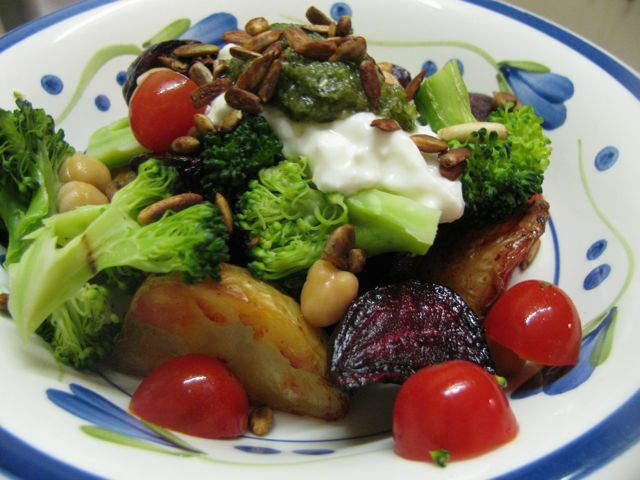 I roasted some potatoes and beetroot, served them with chickpeas, cherry tomatoes, steamed broccoli, cottage cheese, pesto and seeds toasted with a little soy sauce. Most delicious. It was E's birthday this week and he requested a curry. I made a Rogan Josh Curry that I first made a year and a half ago. Rogan josh is a sentimental favourite for us. I made the sauce the night before and worried about the taste but once the vegetables, chickpeas and paneer were in, it tasted lovely and lasted a few nights. But today I will share with you the recipe for another curry I made recently with chickpeas and paneer that inspired me to try paneer in the rogan josh. 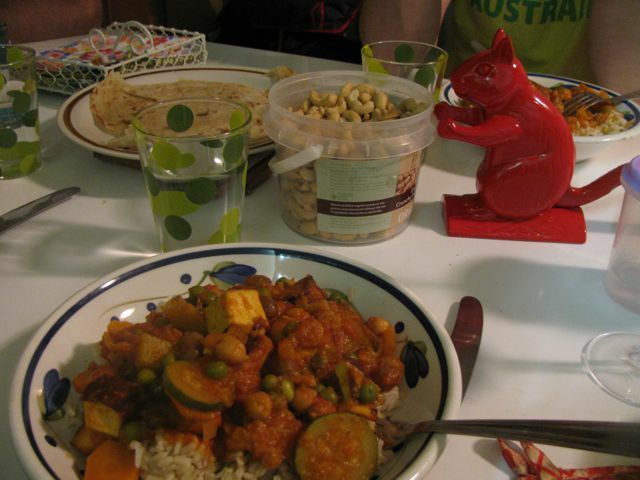 I found the recipe for Chickpeas and Paneer in a Spicy Creamy Cashew Gravy at Lisa's Kitchen. I always love her spicy mixtures but can never stomach as much chilli as Lisa. I reduced the chillis drastically and still thought it quite spicy. I also added quite a few vegetables. It is one of those recipes where the preparation takes quite some time and then the cooking happens in the blink of an eye. You must have the ingredients ready at every step of the recipe. I had thought I needed to soak the cashews ahead of time but when making the dish, I found that the amount of preparation meant I just needed to start soaking them at the commencement of preparations. I was partly inspired to make the curry because I had some unused cream. It made a rich gravy along with the cashews. 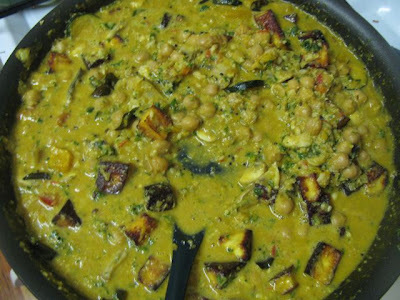 The curry was very rich in flavour and proteins with the cream and cashews in the gravy and the chickpeas and paneer throughout. Not one for dieters. But the house smelled superb. Of course, it also helps if you don't have a baby clinging to your legs as you cook. E lay on the floor and amused Sylvia while I cooked. She was grateful for my efforts and had a little curry through some rice with bits of paneer crumbled up and some extra peas in it. I have found frozen peas very useful in cooling a really hot meal for Sylvia. She loves peas and if I leave them in the dish for a minute or two the peas defrost and the dinner cools enough to eat. Lastly I thought I would share the flat bread that I made to serve with the rest of the rogan josh. It was amazingly quick and easy. 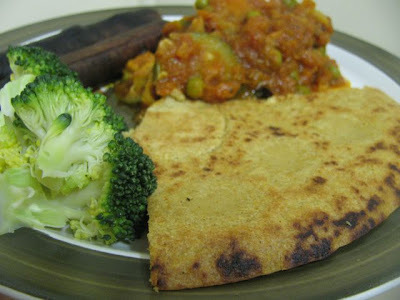 I found it via Ricki who had tried Meghan's protein flat breads or instant injera. I must try this again as I just cooked it as one big flatbread and when re-reading the recipe later I think I should have made lots of lacy thin flatbreads rather than one big stodgy one but it was very good, albeit a little salty. Made me think of socca. E asked where I got the bread and was surprised to hear I made it just before he arrived home. If you used tofu instead of paneer and served the curry with these flatbreads you would easily have a substantial gluten free and vegan meal. But I hope to make both again because they taste so good. Soak the cashews in the cream for 30 minutes or so. Do not soak in blender as you will use it for onion paste. If you start the soaking when you start frying paneer, preparing spices and chopping vegetables it will take you about 30 minutes before you are ready to use cashews. Heat oil in a frypan and fry paneer cubes over a medium heat until evenly browned. Ahem, mine wasn't evenly browned but it was crispy in places. Chop and prepare the vegetables. Using a blender (or a large mortar and pestle), make a paste of the onions, garlic, ginger and chilies. Add a bit of water if necessary to blend. Set aside in a small bowl. 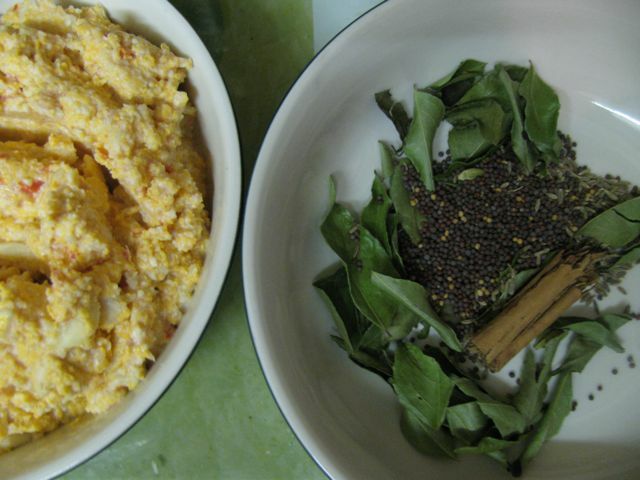 Place curry leaves, cumin seeds, mustard seeds, cinnamon stick, and cardamom seeds in a small bowl so they are ready to throw in the frypan. Transfer cream and cashews to the blender. Add tomato and blend to make a thick and chunky cream sauce. Mine was the type to dollop not pour. Heat butter and oil (or ghee) over medium heat and add curry leaves spice mix.Stir and fry until the mustard seeds turn grey and begin to pop. Remove cinnamon and cardamom. Add the ground cumin, and turmeric to the pan, stir and then add the onion/garlic paste. Stir and fry until most of the liquid is evaporated. 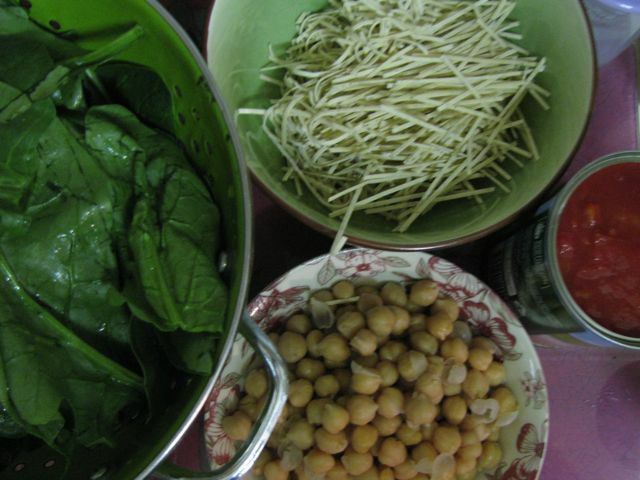 Add chickpeas and stir fry another 5 minutes. Add cashew/tomato paste, fried paneer, parsley, vegetables, garam masala, salt and water. Simmer until the gravy is thickened. This took me about 5 minutes. You may need to adjust the amount of water to achieved desired consistency. 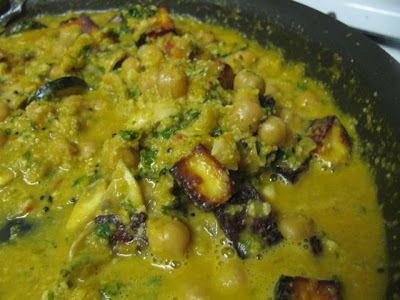 Serve with rice or an Indian flatbread such as roti or naan or the below recipe. Heat frypan over medium high. Spray with oil. Pour in batter. I tipped all my batter in at once but on re-reading the recipe I think I was meant to do just enough to coat the bottom of the pan. Best eaten hot but Meghan says it can be stored in the fridge and heated before serving. On my way to work this morning I noticed the elm trees in Royal Parade wearing their autumn colours. Brights greens give way to reds, yellow and brown. So it is in my kitchen that fresh summer fruits salads and smoothies are being replaced with stewed fruit in warm desserts and baked goods. Melbourne's gardens and markets are producing wonderful rhubarb, apples, pears, figs and walnuts right now. This is a long and rambling post but it illustrates how recipes morph into other dishes and draw on previous experiences. 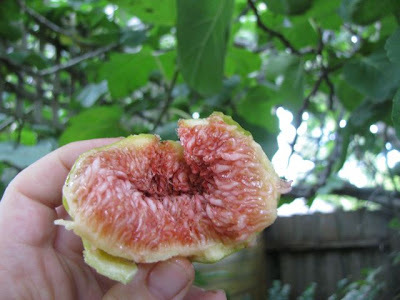 You may remember that over Easter I was given some fresh figs by my friend Yarrow. We ate some figs fresh but there were too many in need of immediate use. 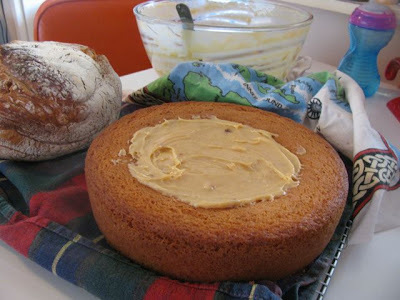 Susan had some interesting fig cake recipes but I decided to try this fig cake recipe and regretted it. It was one of those times when I made changes based on what was in the house and wished I had followed the recipe to the letter. I was mortified at wasting the figs this way so when I saw cheap figs in a favourite fruit and veg shop I bought a punnet of 8. I needed another chance. 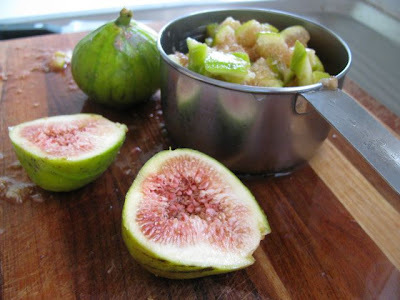 This time I went simple and found a baked fig recipe using orange, honey and walnuts. The recipe suggested serving it over ice cream. However we rarely have ice cream in our house. 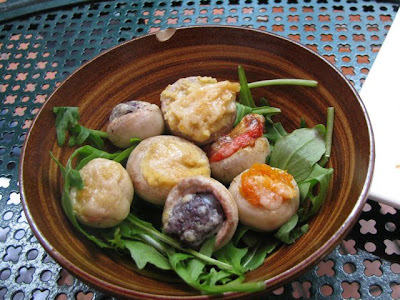 I do like to keep some fruit and spice English muffins in the freezer. I baked half the figs, squashed into a ramekin, with some orange juice, Cointreau, honey and butter. They were lovely with some cream cheese on muffins. The photo is not great but I hope you have some idea of how soft and sweet they were. They would be magnificent with a really good fruit toast and marscapone cheese. I particularly enjoyed the cold leftovers for breakfast on fruit muffins. 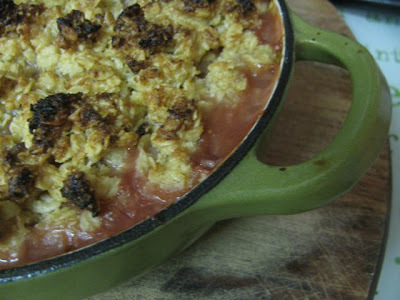 I bought rhubarb at the Collingwood farmer's market around the same time and decided to make rhubarb and apple crumble. I am a bit of a novice at stewed fruit. Last time I put rhubarb in a crumble I didn't cook it first and it was undercooked. So although my mum was on a country drive to Echuca with dad, I rang to check about stewing the fruit. 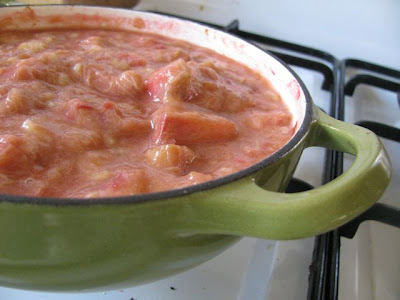 Despite my dad relaying the instructions while mum drove, I still was disappointed in the brown goo that resulted from stewing the rhubarb and apples together. I made the crumble but it was too tart and didn't seem quite right. We ate the crumble topping and I scooped out the remaining stewed fruit and threw it into some banana muffins. It suited me to have extra fruit puree as I didn't have enough butter or eggs for the recipe. The muffins were surprisingly wonderful considering how much change I made to the recipe. Excellent dense cakey texture and full of fruity flavour but not overly sweet. The original recipe was for Banana, Cherry and White Chocolate Muffins from Nigella Lawson's How to Be a Domestic Goddess. 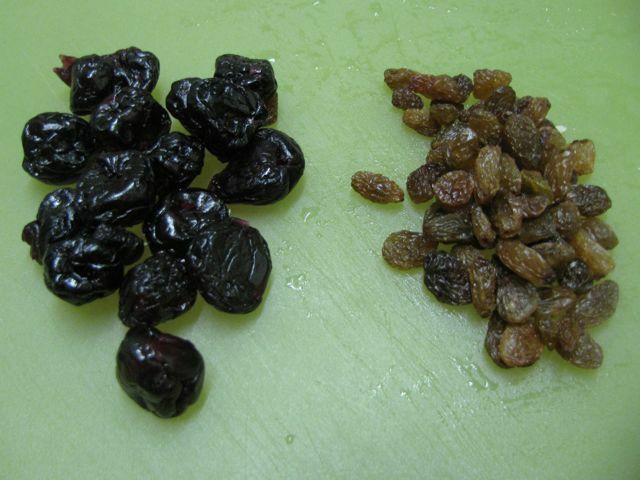 I bought some dried royal cherries at the market lately. They are unlike any other dried cherries I have encountered. Large (as you can see in the photo comparing them to sultanas) and tasting of real cherries unlike the artificiality of glace cherries but unbearably sweet unlike the smaller sour dried cherries. I chose the recipe, partly for an opportunity to use these cherries as Nigella did not specify which sort of cherries. Unfortunately I found the cherries too sweet and preferred the sultanas so next time I would just use all sultanas (or sour dried cherries) rather than these cherries. 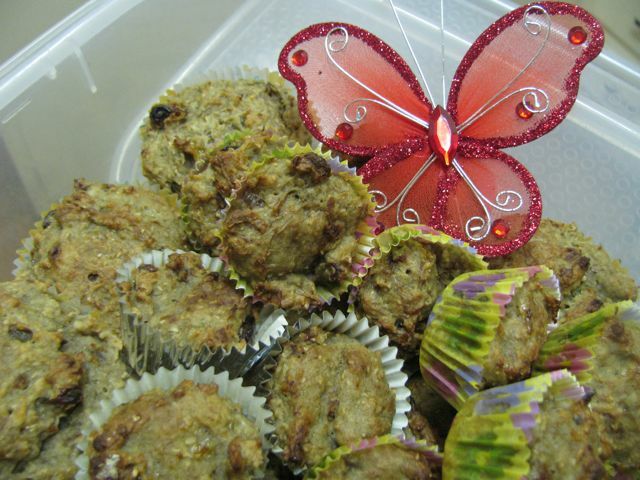 I would also use apple puree if I didn't have rhubarb available but the muffins would loose a little of the flavour. I had 4 figs left and another bunch of rhubarb on the weekend. I decided to repeat the baked figs but then I was concerned they weren't snug enough if I used anything bigger than a ramekin. 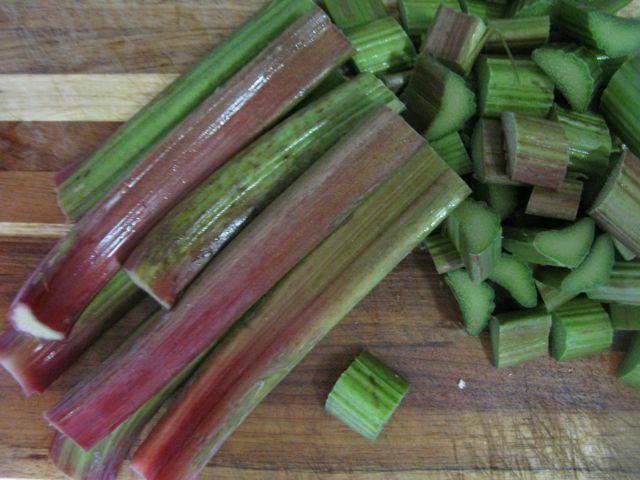 My solution was to pile the chopped rhubarb around it and simply bake in honey and orange juice. It was still a little tart but I added an old banana and some golden syrup. The pink stewed fruit was immensely pleasing. My vision for the figs was to serve them soft and honeyed on pancakes with a crisp cheese crust (a bit like the ones that they serve in the Pancake Parlour). The reality was far from it. I couldn't find the recipe I sought so I made a version of another pancake recipe with some cheese in it. Good recipe but not as crispy and cheesy as I envisioned. Perhaps I need to actually sprinkle cheese on the pancakes as I cook them. My figs got some mushed up with the rhubarb that I could only retrieve a few. 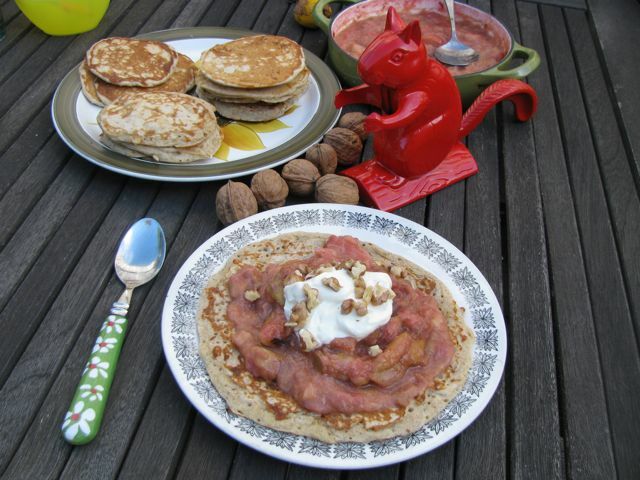 So I served them with some of the rhubarb, a dollop of yoghurt and some walnuts. 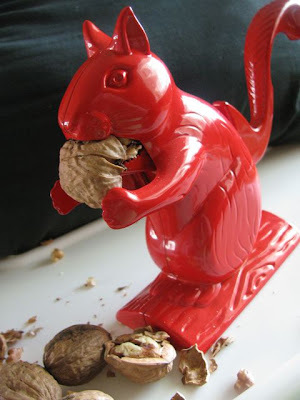 Did I mention walnuts are in season? Big bags of Victorian walnuts can be found in markets and fruit and nut shops. Now that we have our squirrel nutcracker, there is lots of fun to be had in cracking nuts. Ironically, despite all the autumn produce, it was a balmy autumn day and we were able to take Sylvia's high chair out into the back garden and eat lunch outside. We had plenty of pancakes leftover at dinner time. I fried some onion with diced waxy potato, a tin of chickpeas, garlic and a pinch of salt till soft and browned, A few minutes before serving I added some chopped fresh tomato and chopped sorrel. It was delicious over the pancakes. Sylvia didn't have the topping but loved the pancakes. For dessert I added some pear to the stewed rhubarb and made crumble. Sylvia had enjoyed the stewed fruit and gobbled it up with the crumble. E decided he needed custard with it. I told him any idiot could make custard and he went on to prove it. Seriously you can see it is not a bad effort for his first pot of custard (with custard powder, which is what I regularly use). 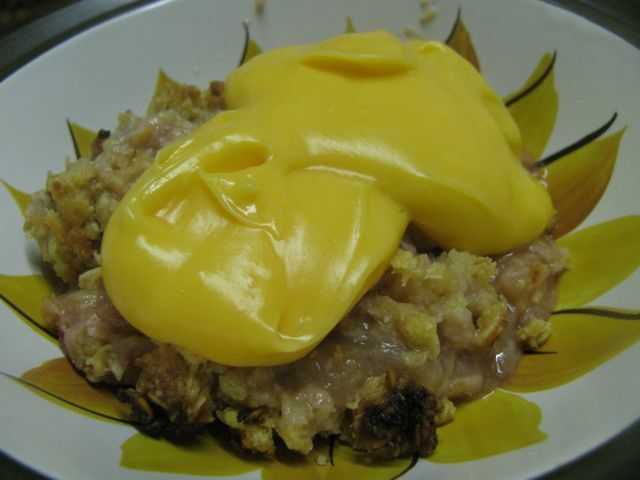 E thought the crumble a bit tart but loved it with custard. I was pleased to finally have a success with a rhubarb crumble and one I could feel Sylvia too. Autumn is a wonderful time for dessert! Place figs in a small baking dish so they are quite close together - I used a ramekin which was a little squashy. Dot butter and drizzle orange juice, zest, honey and Cointreau over the figs. Sprinkle with walnuts. Bake at 180 C for about 30 minutes. The recipe says to baste with juices every 10 minutes but I didn't. When figs are cooked, cool slightly (or altogether - I had some of them the next morning for breakfast). Toast the fruit bread so it is golden brown. 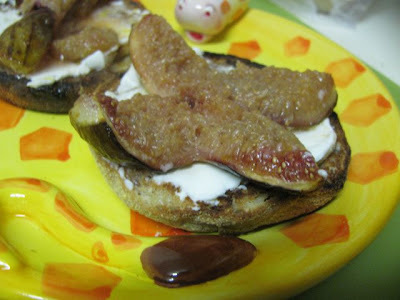 Spread with marscapone cheese or cream cheese and top with figs. Alternately serve on cheese pancakes below or serve over icecream. Mix all ingredients til mixed. Rest for about 30 minutes. Heat non stick frypan, grease with butter and drop dessertspoonfuls of batter into medium hot pan to make small pancakes or about 3 spoonfuls to make large pancakes. (I did about 3 small ones at a time.) Cook till bubbles appear and the underside is golden brown. Flip pancake over and fry another few minutes until it is a lacy brown colour. Eat warm from the frypan or keep for 24 hours in fridge and reheat in microwave. Preheat oven to 180 C and line 12 regular muffins cups and 12 mini muffins cups. Mix butter and fruit purees. Lightly whisk in egg, golden syrup and yoghurt. Add remaining ingredients and mix til just combined. Spoon into muffin cups. Bake for about 20 minutes with regular muffins on top rack and mini muffins on lower rack. Swap around to have mini muffins on top and regular muffins below. Bake an additional 10 minutes. They are cooked when golden brown and a skewer comes out cleanly. Bring rhubarb, honey and lemon to the boil in a large saucepan and simmer for approximately 10-15 minutes til rhubarb is just done. This will make more than you need for the above recipe but can be used for smoothies, crumbles or other baking. Place rhubarb, orange juice, honey and golden syrup in a medium oven proof dish. Bake at 180 C for about 30 minutes or until soft. (I baked my 4 remaining figs in with this lot too.) While it is baking, lightly stew pears in a dribble of water. When the rhubarb comes out of the oven add banana and pears. To make the crumble, rub the butter into the remaining crumble ingredients til moist and crumbly. Mine seemed to have too much butter so I think I would use a bit less (maybe 50g for a start). Scatter the crumble over the stewed fruit. Bake at 180 C for about 30-40 minutes til the crumble topping is golden brown. I think mine was came out a little earlier but I knew I would be reheating it in the oven over the next night or two so I didn't want it too overdone - esp as the peaks were a little dark. Serve warm with cream or yoghurt or custard! I can eat it cold for breakfast too but I know that is not everyone's preference! Sylvia has not been sleeping over the last few evenings. It is most exhausting. Fortunately we can take turns with her. It seems a great achievement that we have still managed to watch an old black and white horror movie, write a new song (E) and make soup (me). 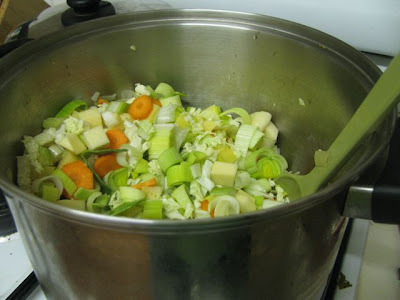 I was glad of the pot of soup when I got home last night after an impromptu visit to my folks in Geelong yesterday for John's birthday (my sister Francesca's partner). 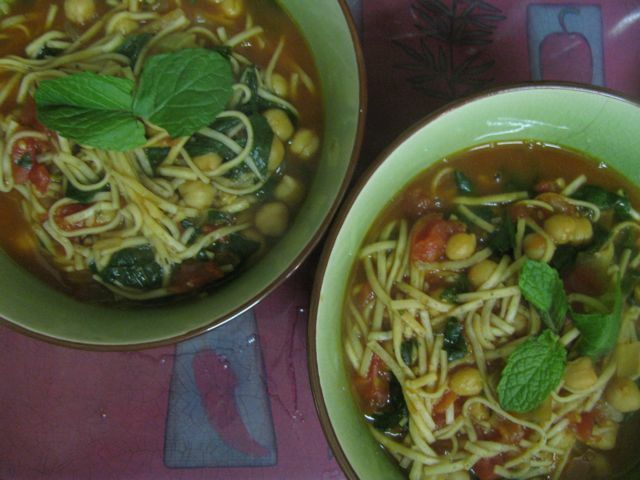 The soup was one inspired by Jacqueline and Lisa's No Croutons Required event. This month the theme is the allium family (ie onions, leeks, garlic, shallots etc) in a soup or salad. 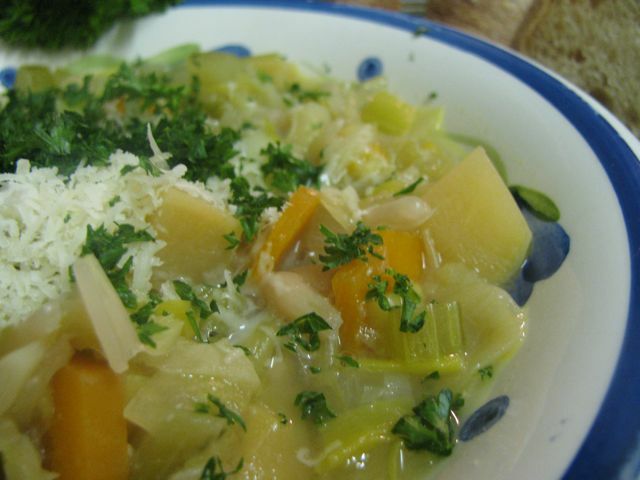 As soon as I saw the theme, I remembered a garlicky soup that a housemate once made from one of my cookbooks. I think it was the Very Garlicky Soup in Richard Cawley's Green Feasts. So I made it on the weekend. It is a most unusual soup. Though it has lots of vegetables in it, it is quite unlike my usual efforts. It has 16 cloves of garlic, blanched three times and cooked whole in the soup. Sounds intense but they add sweet mellow flavour rather than bite. 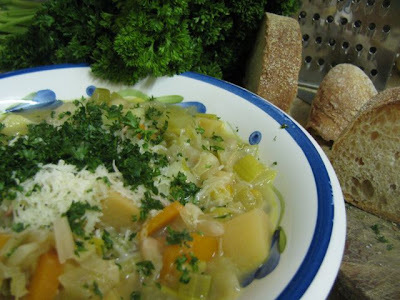 The soup also has onions and leeks so it is full of allium. It is also lacking in colour. I chose to use yellow tomatoes because red tomatoes seemed too garish for this soup. Even the carrots seemed a little colourful and I wonder about using parsnips next time for a total whitewash. It seems amazing that I managed to chop all those vegetables while Sylvia was so unsettled but it did mean we didn't need to rush home from Geelong too early the next day. Not that we were starving. We ate well at my mum and dad's. The roast dinner was full of interesting vegetables like beetroot. Even Sylvia loved it. My mum and Fran did an excellent job with dessert. It was full of the decadence suitable for a birthday celebration (and the celiacs didn't miss out). We had chocolate pudding (with a GF version), sacher torte (made with soy flour so it was GF too), a GF flourless chocolate cake, macaroons and a sponge cake. I then dropped in at my friend Kathleen's on the way home. Sylvia was fascinated by a bowl of citrus fruit. I was amused by Kathleen's son asking for a "tandarine" - I am not sure if he was after a tangello or a mandarine. Then on the way home I was saw one of the most intriguing car number plates that I have seen for some time: YNOTME. Clever or provocative? Once we got home, I was able to heat the soup and serve it quickly with some parmesan cheese and parsley. It was very good with some crusty sourdough bread. We were able to eat before watching Matt Smith's debut in Dr Who. It wasn't pretty watching him eating eating fishfingers dipped in custard. However, Matt Smith does an excellent job in filling the large hole left by David Tennant. We had leftover soup for dinner after I got home from work tonight. It was excellent with a spoonful of pesto. So good I didn't even need bread. I am not sure I would make this soup too often but I would make it again. 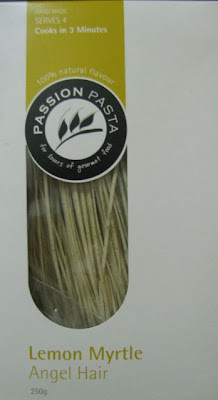 And I recommend it to others, not just for the taste but for a new perspective on garlic. Place garlic cloves in a small saucepan, cover with cold water and bring to the boil. 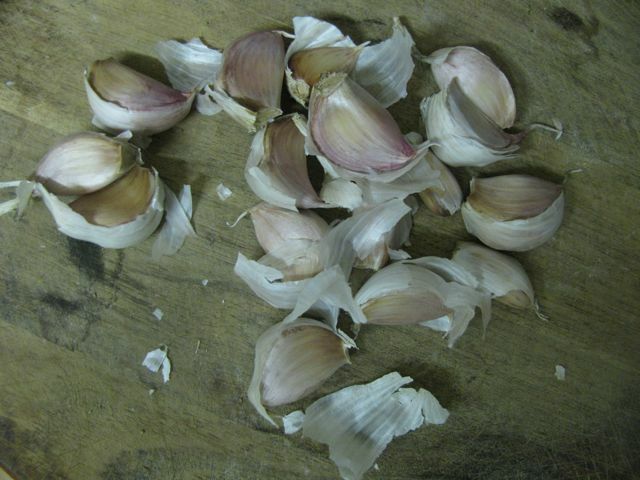 Drain garlic cloves. Repeat two times. Add cannellini beans, garlic cloves, stock and water. Check and adjust seasoning according to taste (the recipe called for 1.7 litres of stock but I thought 500ml was enough.) Bring to the boil and simmer for about 20 minutes. If you are going to serve straight away simmer another 10 minutes or til the vegetables are soft and cooked. 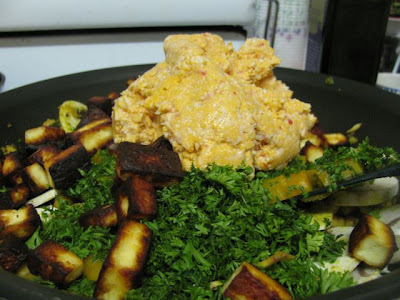 If you are going to eat it later, turn off the heat and cool in the pot. Reheat when ready to eat. Serve with parmesan cheese and parsley or pesto. Last weekend we went to Collingwood Children’s Farm Farmer’s Market. 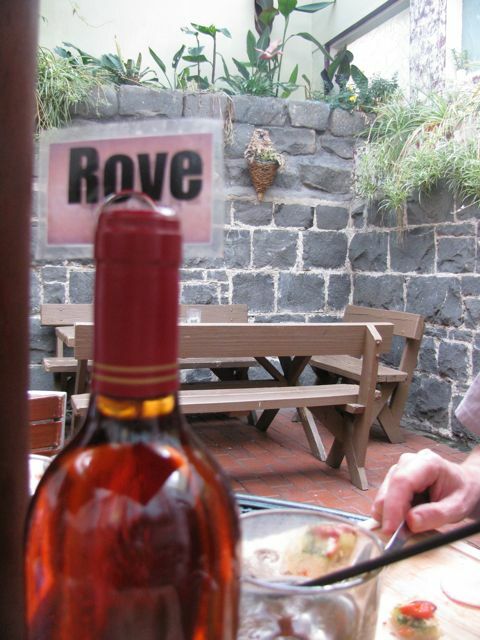 It is always full of interesting food and lively families. Sylvia loved watching the other kids. E was content to sit on a hay bale eating his farmer’s breakfast. I loved perusing the stalls in search of inspiration. 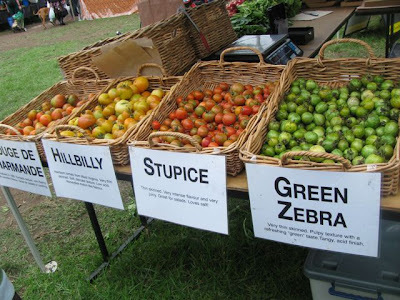 As usual, we were among the latecomers and I missed out on buying peaches, rhubarb and bread because I wanted a quick wander and a think before making any purchases. No’ fast, you’re last, as E likes to say. Sylvia was also very helpful with tasting foods for me. Stall holders are less offended if a baby shows their dislike by opening her mouth and just letting the food fall out but I don’t think I could get away with it. Unfortunately babies are so fickle. Sylvia took an initial dislike to a seeded sourdough and on that basis I decided to buy an excellent fruit bread from the Hope Bakery instead. Once I had made the decision, she then couldn’t get enough of the samples of the seeded bread. Sylvia also loved the cooked corn on the cob that is sold on a stick for snacking. Unfortunately by the time we got her beans on toast at the café, she was tired and then the heavens opened and we knew the rain was a sign that it was time to go home. 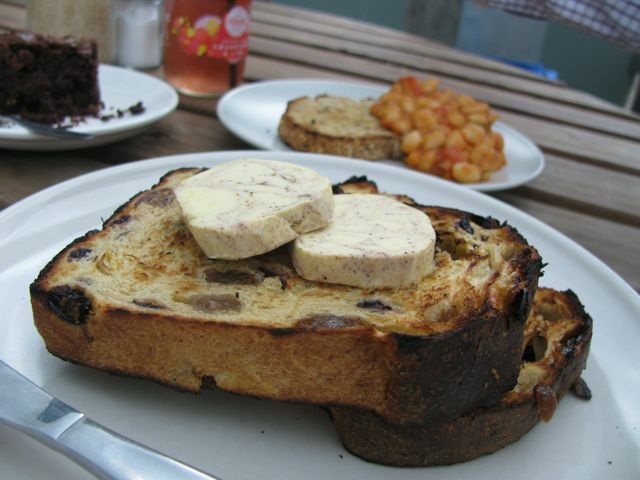 I had a lovely fruit toast with cinnamon butter that I ate quickly. The remains of E’s brownie came with us wrapped in a napkin. Sylvia's beans were barely touched. So much interesting food! I passed on the wonderfully-named heirloom tomatoes but bought sorrel but regret to say it only got used today (but it was excellent with some onions, potatoes, chickpeas, tomatoes and garlic over some cheese pancakes).. I found some heirloom rhubarb elsewhere after Di sold out of hers. I was excited by the angel hair pasta and decided it would be just the sort of thin pasta needed for a Chickpea and Spinach Soup recipe in An Honest Kitchen. For those who are not familiar with this e-magazine, An Honest Kitchen is the brainchild of two bloggers that I love reading: nutritionist, Kathryn of Limes and Lycopene and amazing photographer, Lucy of Nourish Me. 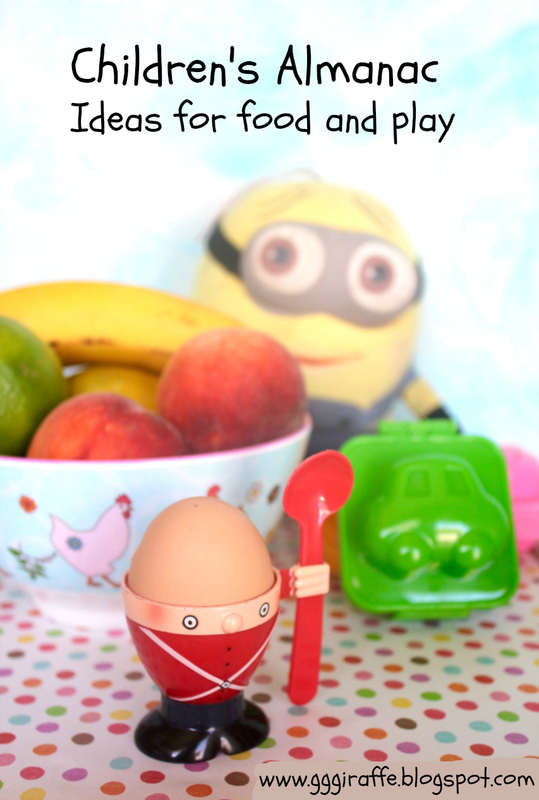 Both blogs are full of wise advice, lovely writing and great recipes. But I confess I don’t subscribe to An Honest Kitchen for a few reasons, the main ones being that I have so little time for reading online and when it comes to magazines I prefer a hard copy. Nevertheless, when they announced a competition to photograph a dish from An Honest Kitchen, they were kind enough to extend the competition to those who don’t subscribe and those who don’t have a flickr account. Hey, I thought, what nice people to forgive me all my lack of subscriptions and let me participate anyway. I decided to join in, not with any expectation of winning, but because I really like Lucy and Kathryn and am much more comfortable with participation than subscriptions. Well I went home from the farmers market with good food and good intentions. I had some kale and decided I would use it instead of spinach and then I just kept on going on tangents from the recipe til my dish was unrecognizable. It was terrible. I blame the kale that was past its best but the flavours didn’t quite work anyway. The next day I tried to follow the recipe again. I didn’t quite managed to stick to it but it was very close. The spinach was far superior to the kale. The soup was excellent: simple, fresh, quick and full of magnificent flavour. Not as many vegetables as I usually would like but still substantial enough to make a meal and much quicker than many of my soups. I wondered if maybe I should subscribe to An Honest Kitchen after all. I am sending Lucy and Kathryn the top photo but I am sorry to say it isn’t my finest moment in photography. As usual, I was too impatient to take many photos but I hope you can see how good it tastes. 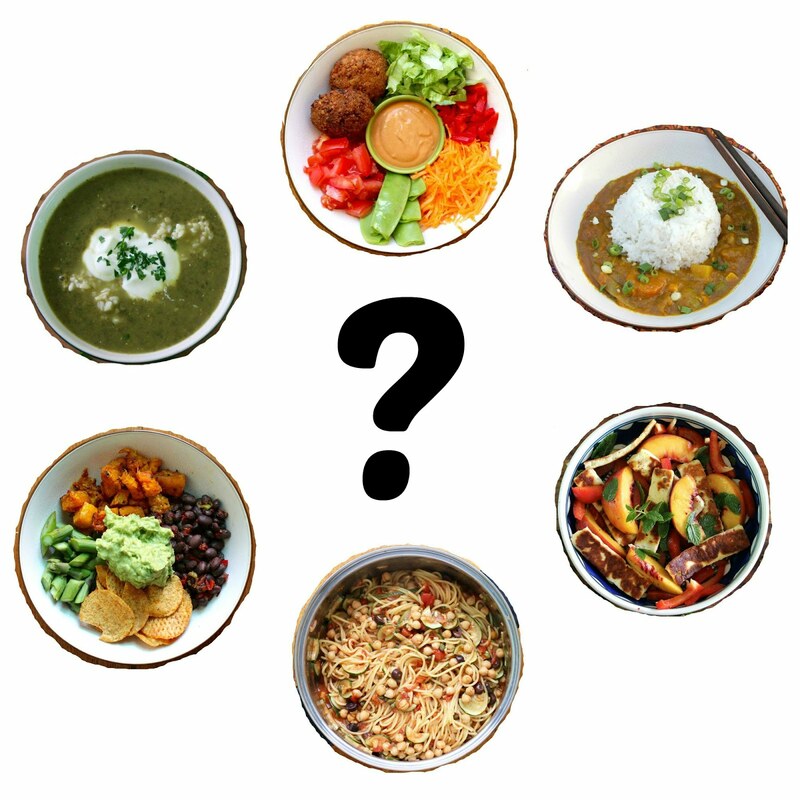 As for the rest of my food, I am out of time and will need to tell you about it later. Below is what I did with the soup. Heat a large saucepan on low heat. Add the olive oil and once that has warmed through, add the onions. Fry for about 5-10 minutes. While the onion are cooking boil the kettle. Break up the noodles into pieces about as long as your hand is wide. Pour the water over the noodles to soak while you attend to the rest of the soup. Add the chickpeas, tomatoes and about 400ml water (ie fill the empty tomato tin with water and pour into saucepan to rinse out as much of the tomatoes as possible.) Turn the hotplate up to medium heat. Bring to the boil and cook for about 5 minutes (I think this is meant to be the opposite of a gentle simmer but I can’t find the words – robust simmer, powerful simmer, raucous simmer?) It doesn’t thicken, it just absorbs flavour. 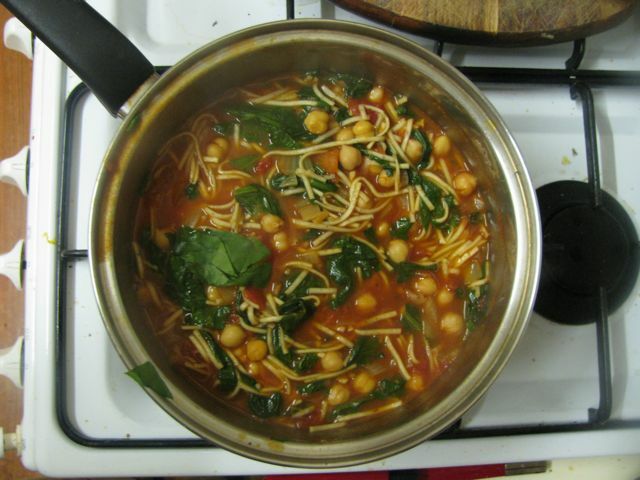 When the tomato and chickpea soupy mixture is almost at the end of the sturdy simmer, drain the noodles. 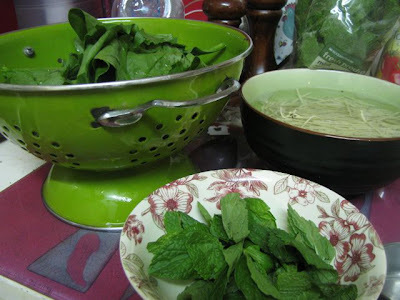 Add the drained noodles, spinach and most of the mint to the saucepan. Stir for about 2 minutes or until the spinach has just wilted and retains its bright green colour. Stir in the tamari and season to taste. Serve with some extra mint leaves as garnish. Update May 2010: have found this works with broccoli added when I add the tomatoes and chickpeas and substituting soba noodles for the pasta. Update: June 2017: made this with regular spaghetti so cooked it a little longer. The sauce was thicker but delicious. No mint about so used paprika, ginger powder, pepper and worcestershire sauce instead for seasoning. I didn't add any greens into the soup but served them on the side.